In 1939 Krakow, Poland, seven-year-old Anna awaits her father’s return at Herr Doktor’s pharmacy. Gavriel Savit writes “To a child, an empty hour is a lifetime” in his insightful debut novel, “Anna and the Swallow Man” (Knopf 2016). Motherless Anna eventually realizes that her linguist father will not be returning, although she doesn’t know it is the Gestapo that has taken him. Savit speaks of the “wise clear-sightedness of a child” which some adults name “precocious.” The reader will remember how it felt to be a child, making sense of an incomprehensible world. 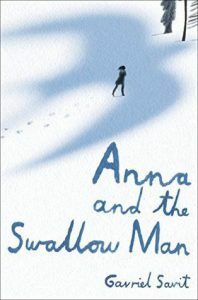 Both the Swallow Man and Anna speak Polish, German, Russian, easily and well. This helps. They always wait for any stranger to speak first, and they match language and dialect. After all, Anna’s father was a linguist. Anna is adaptable. The pair, overall, speaks the language: Road. They speak in riddles in the presence of others. The Swallow Man has rules—rules that will keep them alive. “To be found is to be gone forever.” (Her father had been found). When they are in a large town, the pair enacts a prosperous father and daughter out for a stroll. When in the country, the pair became regional country folk. They each have two sets of clothing, one being stored in the thin man’s satchel. Over the seasons and the years, new clothes are procured, oftentimes taken off dead bodies. Another tenet—“Money divides people into buyers and sellers,” so they use no money. They are given food or exchange tasks for food. The Swallow Man has a knack for making comrades out of each acquaintance. He teaches Anna that other humans are their best bet for survival. He also teaches, “People are dangerous.” In spite of this, Anna makes a friend of an itinerant musician, who accompanies the pair for a time. Another of the Swallow Man’s rules—he is the riverbank, she flows within. He is in charge, she will follow his lead. Until the day that even the Swallow Man becomes unreliable—grossly unreliable. Anna, now ten, must take their survival into her own hands. How many people hide themselves in full view? I had never before thought of this in terms of Jews during World War II. Savit, a working actor, professionally takes on other identities. In his book, he probes mysteries of identity, adaptability, death, and ethics. This “young adult” book should be read by adults. What How and Why do You Write?